Care in moving around is necessary to stop De-ashi-barai. Do not keep your feet too close together or make large steps forward. Do not skip about the mat on your toes. Instead move about with fairly small steps, always being ready to transfer your weight from the forward foot to the rear foot and vice-versa. There is one very spectacular counter for this throw which is extremely difficult to do. This involves taking your foot out of the way of the attacker's incoming sweeping leg, inserting it behind it and doing exactly the same sweep back on him using the impetus of his own attack. An easier counter is to keep your weight off your front (right) leg. 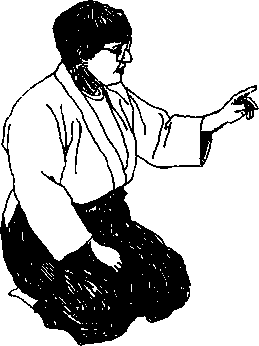 Let your partner sweep your right leg a little and then, using this, move in for o-soto-gari.